The National Popular Vote bill would guarantee the Presidency to the candidate who receives the most popular votes across all 50 states and the District of Columbia. Explanation. 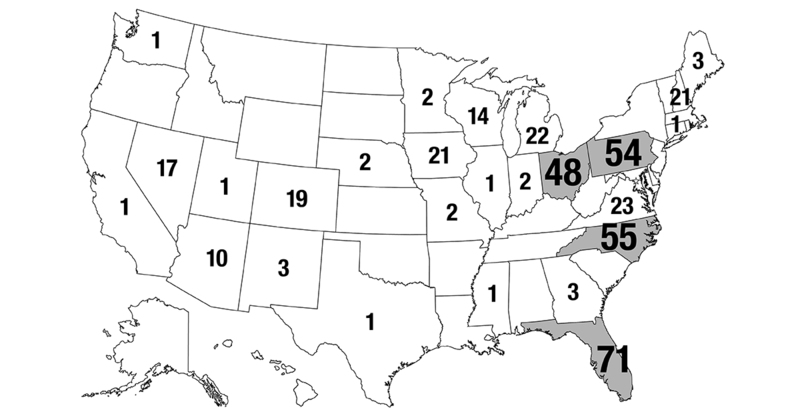 It has been enacted into law in 15 jurisdictions with 189 electoral votes (CA, CO, CT, DC, DE, HI, IL, MA, MD, NJ, NM, NY, RI, VT, WA). The bill will take effect when enacted by states with 81 more electoral votes. The bill has passed one house in 8 additional states with 72 electoral votes (AR, AZ, ME, MI, NC, NV, OK, OR), including a 40–16 vote in the Republican-controlled Arizona House and a 28–18 in Republican-controlled Oklahoma Senate, and been approved unanimously by committee votes in two additional Republican-controlled states with 26 electoral votes (GA, MO). Two-Thirds of 2016 Presidential Campaign Was in Just 6 States – 94% of Campaign Was in Just 12 States. Two-Thirds of 2016 Presidential Campaign Was in Just 6 States 94% of Campaign Was in Just 12 States.